Pre-Winter Crochet Week is at it’s mid-way point…I have to say it’s been so much fun on the CLF message board on Ravelry.com, and on our facebook page. It seems I have a new local group, my best friend (who can crochet, but prefers I make the hats…sigh…”you’re quicker” she says…but at least she handspins lovely yarns and I get to play with soft and yummy goodness) and another friend who fell in love with Amigurumi and wanted to learn. We’ve decided this shall happen every tuesday at my best friend’s house (she is the famous pair of feet in my Bestest Friend/Loopy Lou sock pattern only $.50 for a download, special CLF Savings 😀 I am going to raise the price back to $4.00 after the holidays!). I have to say that this gal who’s initials really are CLF (It’s fate I tell you), is the BEST novice crochet student I have ever had. In our first lesson we went from chaining straight up to single crochets and shaping! She made the body of her piggy the first lesson, tonight? We made the snout, legs, ears and curly queue tail 😀 I made up the pattern on the fly, and she got it…every step of the way and tonight? She learned to READ the pattern! Talk about gratifying! And a rear-view of that cute little tail! This is her very very first ever crochet project!!! We’ve had so much fun, and the best part as her guide, has been watching her sense of satisfaction and accomplishment along the road. In her “spare” time, she is a 4-H leader and has a gaggle of pre-teen and teen-aged girls at her heels, she wanted to learn to make critters for them as gifts…too much fun! Crocheting Tote Bags from Zazzle.com. This was too fun to make!! 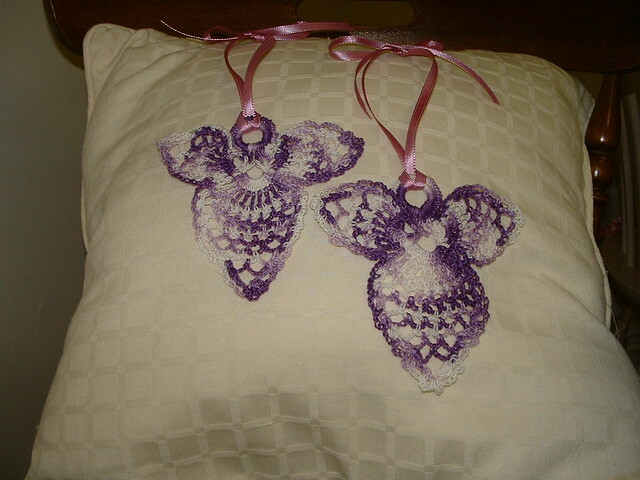 Beautiful and quickly made ornaments and appliques can be easily achieved with so little effort! Don’t let people fool you, it’s not hard, it’s just a matter of paying attention to your counting! 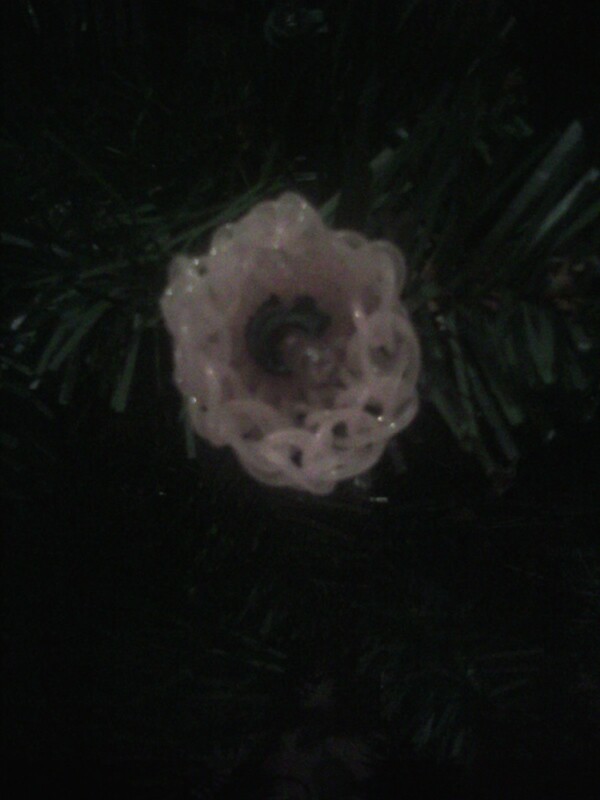 So, why not make some snowflakes or flowers? If you don’t like thread, MANY sock yarns will work up beautifully too! 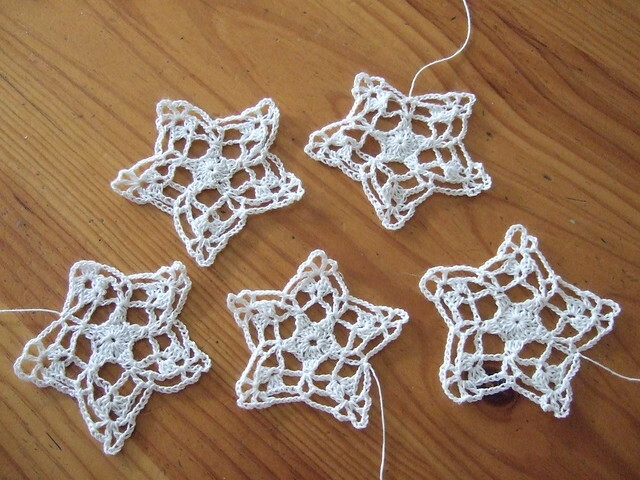 These cute stars were made by catsmum on Ravelry, the pattern (click on photo to get there) is by Julie A. Buldoc for JPF Crochet Club. Love MUCH! SHINY!!! SPARKLEY! Now that's what I'm talking about!! 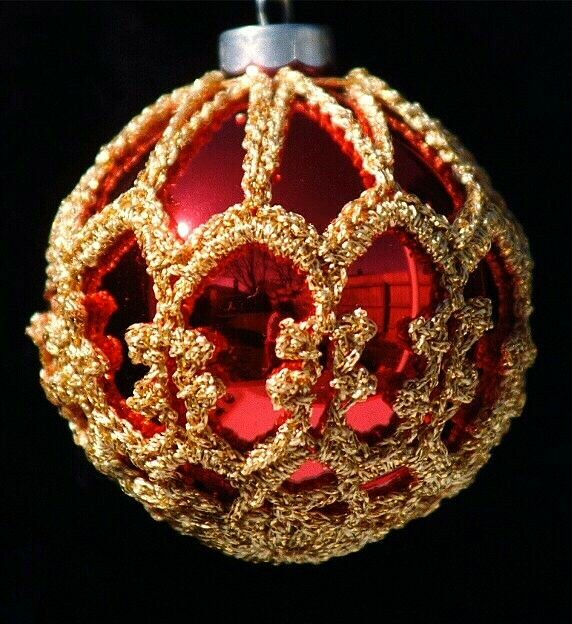 I love the glass ornament covers! WOWSIES…and they aren’t as difficult to make as they look…the fabulous use of negative spaces involves really long chains, that’s it folks…COUNTING…I know you can do this!! This lovely pattern was designed by Susan M. Allen, click the pretty picture to get to the pattern download on Ravelry.com! These angels are just too dainty 😀 Click the photo to get to the project page on Ravelry.com. Designed by Pascilla Hewitt, this pattern is free via a direct PDF download on the project page on Ravelry! In the words of Molly from the musical Annie, “Oh my goodness, oh my goodness!” This is such a beautiful keepsake ornament! It’s worth EVERY penny of the $5.00 price tag! Click on the photo to go to the pattern download page on Ravelry.com. Designed by Sue Pendleton. I have to say I am in love with this beautiful piece! B) If you can’t seem to lighten your grip there are several things you can do. 2) Get the egg shaped hook handles that you can put over your steel hooks. Hey all! A few of our CLF members are in for this week being a “holly jolly” week of fun and loops…so I thought I would post two great contests! Karen Ratto Whooley, of KRW Knitwear Studios is hosting a drawing on her site for one of two Etimo hooks! You can’t win if you don’t enter! Go to her site for more information and a chance to win one of these two awesome hooks! Also our beloved Jim “Jimbo” Price has a great contest up on his blog for a hand carved Holly hook! Go to his blog for a chance to win! Did you like the LED Christmas Light Cozy? Let the Pre-Winter Crochet Week Begin! 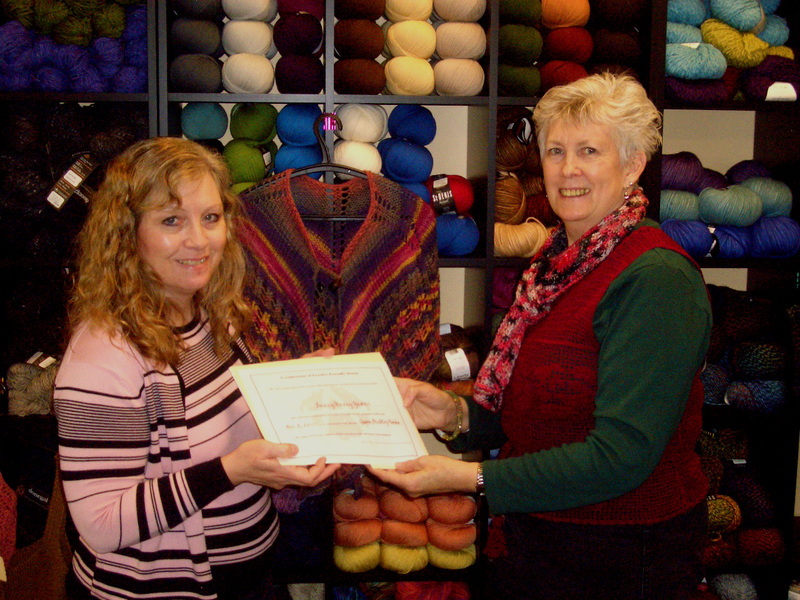 Gwen Blakely Kinser presents Chris Krauss with the CLF Crochet Friendly LYS Certificate! I can’t think of a better way of kicking off this week than by sharing some fun and great news!! Gwen Blakely Kinser, known to many as the founder of the Crochet Guild of America or humbly as Crochet Queen on her blog and as “Crochetkween” on Ravelry,honored her local yarn store, with a CLF Crochet Friendly Certificate! High praise indeed for an LYS! Fuzzy Wuzzy, owned by Chris Krauss, in Arlington Heights, Illinois must be something pretty darned crochet friendly for our beloved Crochet Highness to dub them crochet friendly! If you’re in that neck of the woods, stop by and say hi, pick up some yarn and some hooks and tell them THANKS from the CLF!! Do you have a favorite LYS, one that is crochet friendly? In our opinion it’s the perfect gift for the yarn store that has everything this sparkley light-filled season! I’m getting holly jolly excited about the pre-Winter Crochet Week starting Sunday Dec. 5th running through Saturday Dec. 11th. For the past two days, I’ve ruminated on what kind of pre-wintery goodness we can come up with! Now, I realise this is northern hemisphere biased, sorry folks in OZ, but you southern hemisphere types can participate as well by taunting us up North with your summery yummy goodness! 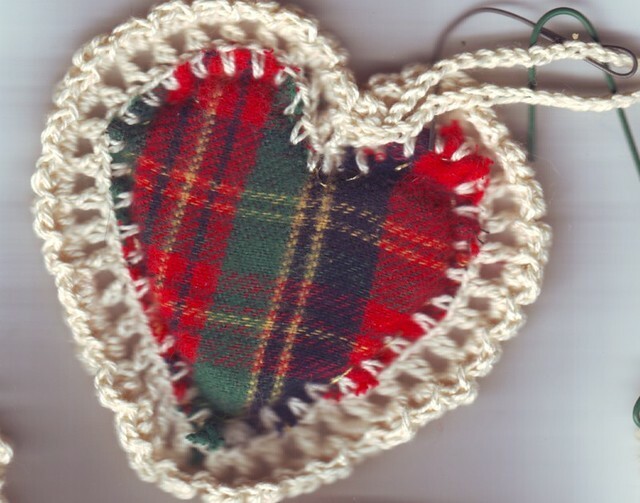 Crochet Bloggy Goodness… Here on the CLF Blog each day of the Pre-Winter Crochet Week there will be wonderful hookalicious goodness to inspire you! If you are a crochet blogger I encourage you to post wonderful pre-wintery crochet stories and links to positive crochet in the news on your own blogs! Let’s get a real happening crochet presence out on the web! On the CLF Message board on Ravlery.com we shall exhort the greatness that is crochet and all we love about it…and I may have a few fun little projects to share here on the blog. Currently, I’ve been playing with some Jelly Yarn making some yummy bits for my tree 😀 I’m thinking these will make it up on the blog tomorrow 😀 Simple, quick and fun!